Walk up Legge Lane in the Jewellery Quarter and you’ll spot an abundance of beautiful old buildings. But, there’s a tall, ornate terracotta building that stands out from the rest. The building is an old pen-making factory designed by architect, AH Woodward. Not really surprising, since the Jewellery Quarter has a rich pen-making history. Constructed in 1893, as a purpose-built factory to make pens, pen holders and pencil cases, it is known for its gabled terracotta façade and was one of the first terracotta properties in the city. Terracotta was popular in Birmingham because it was resistant to smoke and soot; imagine the booming Industrial Revolution and the horizon filled with dark plumes. Birmingham was made famous, and still is today as the founding city of the Industrial Revolution, but all that smoke and soot was not ideal for buildings, so terracotta was a good option. 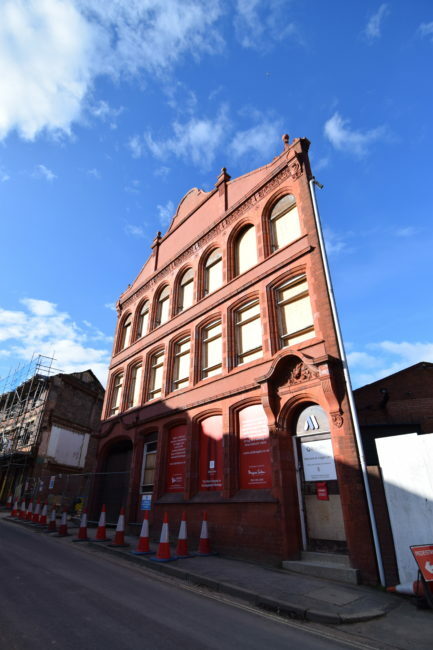 The building was awaded Grade II listed status in 1982 and is now set to be sensitively refurbished into apartments very soon.